Image caption A campaign poster against deporting non-Swiss residents convicted of petty offences reads "Enforcement Initiative NO"
Swiss voters are going to the polls on Sunday to decide on a proposal to automatically deport foreigners who commit minor crimes. 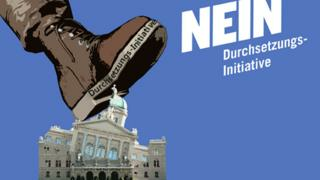 The proposal, known as the "Enforcement Initiative", has been put forward by the right-wing Swiss People's Party (SVP). It is not the first such vote: in 2010, the Swiss backed proposals to deport foreigners convicted of murder or sexual violence. That policy has come into force, but the Swiss People's Party, believing it does not go far enough, now wants to strengthen it. The new plan would also deport those who commit two minor offences, such as speeding, or arguing with a police officer, within 10 years. There would be no right of appeal: conviction would lead to deportation in every case, regardless of individual circumstances. Supporters of the proposals say it will make Switzerland a safer place, and point to statistics indicating that foreigners take up more than their fair share of prison cells. Opponents argue that those statistics reflect only a partial reality, because many of those in prison are illegal migrants awaiting deportation anyway, while the proposed new law would target the 25% of the population who are foreign, but permanently and legally resident in Switzerland. Image caption A notorious black sheep poster reads: "At last make things safer! Say yes to deportation of criminal foreigners!" The campaign has been emotional and divisive. An infamous black sheep poster, widely criticised as racist when it was first used by the People's Party several years ago, has reappeared. Opponents of the new law have responded with blunt posters of their own, showing jackboots stamping on the Swiss parliament, and the figure of justice being smashed by a wrecking ball. What seems to worry some voters most is not the idea that the Swiss government should be tougher on crime, which is in fact low by European standards, but that the new proposal would create a two-tier justice system, one for the Swiss, and one for foreigners. Getting Swiss nationality remains a long, complicated, and relatively expensive process. Being born in Switzerland does not confer citizenship, so hundreds of thousands of Swiss residents may not have a Swiss passport, but have never actually lived anywhere else. Hypothetical cases are being offered to try to give voters a picture of how the new law would work. Take, for example, two young men born in the same village, who attended the same school, and have lived all their lives in Switzerland. But only one is Swiss, the other is third-generation Portuguese. Both are convicted of petty offences, possession of cannabis perhaps, or being drunk and disorderly outside a nightclub. After they get their driving licences, both are booked for speeding. Under the new law, the Portuguese would be automatically deported, irrespective of whether he had ever lived in Portugal, could speak the language, or whether he had dependants in Switzerland. This prospect has struck real fear into Switzerland's foreign community, with some families even approaching their Swiss neighbours and quietly pleading with them to reject the proposal. Others have lashed out, bitterly condemning the Swiss People's Party as dangerously discriminatory. "How long before foreigners are forced to wear a sign so that the law-abiding Swiss know to steer clear of them? Maybe a big red A for Auslander (foreigner)? ", wrote one. A leading Swiss columnist has even described (in German) Sunday's vote as Switzerland's "Nazi moment", suggesting that the imagery and the language of the Yes campaign bear comparison with Germany in the 1930s. The Swiss People's Party angrily rejects such comparisons, arguing that getting tough with foreign criminals will protect other law-abiding foreign residents who, the party line goes, currently risk guilt by association simply because they are foreign. But the People's Party is well known for campaigning on one single issue: immigration. Many political analysts see this vote as the latest in a clever strategy to keep that topic at the forefront of voters' minds, so that when parliamentary elections come around again, the Swiss People's Party can, it hopes, gain yet more seats.